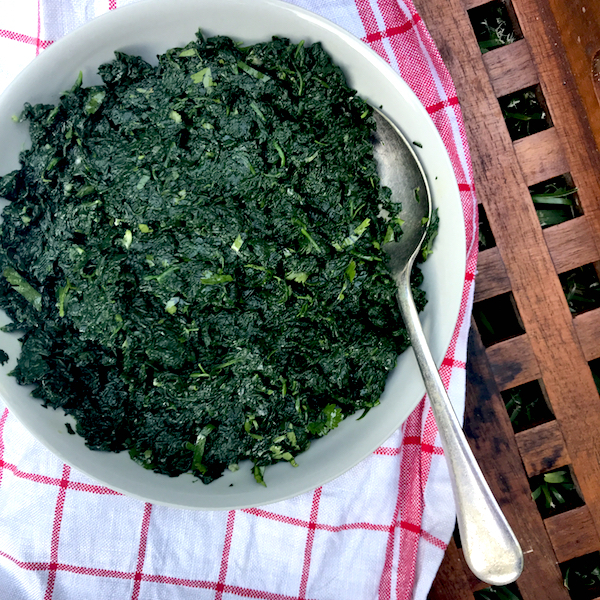 I’ve made this spinach for many years it comes from one of my oldest, faded and food splattered cookbooks – Madhur Jaffrey’s, Eastern Vegetarian Cooking. In the days when I could get cold-pressed Yandilla mustard oil from my local supermarket I used to use mustard oil. But Yandilla mustard oil is much less widely available nowadays ( and the mustard oils from the Indian grocer always look a bit dodgy to me) so I tend to use olive oil which makes a much less spiky and pungent dressing. This spinach is served at room temperature and similar to a pesto but thicker and more of a side dish than a sauce. Traditionally this dish is made with a mixed greens that would include chana greens, mustard greens and spinach. I generally just use spinach but you could experiment with any other greens you have available, kale, silverbeet, fenugreek or beetroot greens would all work. The Biharis eat it for breakfast with pooris and tea. Years ago before I had my son and got pushed by necessity into more kid-friendly breakfast food I used to serve it for brunch with mung dal pancakes, a yoghurt raita, spiced fried potatoes, pickles and chutney. It was delicious! Now I only eat it for breakfast as a left overs from the night before but it is very good breakfast food, but how can you go wrong with any kind creamed spinach. You can eat it with chapatis, crackers, on toast with eggs or with any Indian dosa-style pancakes – it’s surprisingly versatile particularly with the more mellow, familiar dressing made with olive oil. Bring 4 litres of water to the boil, put in the spinach and cook on high heat until wilted (about one or two minutes) Drain and rinse under running water, let cool a little and squeeze out as much water. Place spinach in food processor or blender add a couple of tablespoons of water and blend until it is a thick paste. Place the spinach into a serving bowl. Make dressing by mixing together ginger, garlic, green chilli, coriander, salt and oil. Add dressing to spinach and mix well. Adjust seasoning to taste and serve. *I find it very to gauge the amount of spinach in recipes from weight. For the photographed dish I used about 3 1/2 small bunches and increased the dressing a bit but it’s still a bit thicker than usual as I was rushing to get it finished to photograph it before the light went. This is just to let you know your spinach dish may be a bit smoother and not quite as thick.